People with asthma suffer from spasms in which their airways contract, resulting in wheezing, coughing and difficulty breathing. According to Brown University, coughing is the primary, or even the only symptom of asthma in some people. Asthma coughing after eating can be due to several causes, called triggers. Identifying your asthma triggers can help you control your symptoms. A cough that persists more than ten days, difficulty breathing, wheezing or gasping may all be signs of asthma, according to Brown University. Your doctor may measure your lung function with a tool called a spirometer, or ask you to blow into a peak flow meter, a simple tool for measuring how much air you can take in and exhale. The doctor will look at your medical history and ask you about your experience with asthma to try to identify triggers. Acid reflux, in which stomach backs up into your esophagus, can trigger asthma. Eating fatty food, spices or peppers, chocolate, vinegar or vinegary condiments such as mustard or ketchup, or drinking alcohol can all lead to acid reflux, which in turn can trigger asthma coughing. Certain foods can also trigger asthma. Oregon Health and Science University lists fish and shellfish, tree nuts, milk, eggs, peanuts, soy, wheat and food additives as common asthma triggers. Eating these foods could cause asthma coughing. You can control your asthma by avoiding triggers. You can have allergy testing to identify food triggers and avoid these foods. If you have acid reflux, you can avoid eating foods that trigger reflux, take medications to prevent reflux, and avoid lying down too soon after you eat, which can worsen reflux. Physicians treat asthma with a variety of medications, including antihistamines, steroids and bronchodilators, which open air passages. Long-acting beta antagonists reduce inflammation and help open the airways but these drugs can increase your risk of a serious asthma attack. They are often combined with steroids. 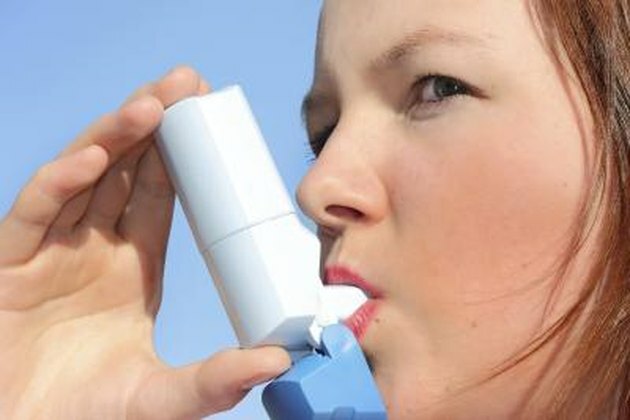 You may also use a quick-relief inhaler, which provides relief in the event of an asthma attack. Managing your asthma may involve a program of medication and lifestyle changes. You should try to remove triggers such as dust from your life and avoid things that might trigger asthma coughing, such as certain foods. Your doctor may ask you to monitor and records your peak flow meter readings daily. This will let you see if your medications are controlling your asthma. If your peak flow readings begin to decrease, contact your doctor. You should carry a quick-relief inhaler with you in case of an asthma attack.